Spy rise slot by Playtech play the demo of this cyber crime game! 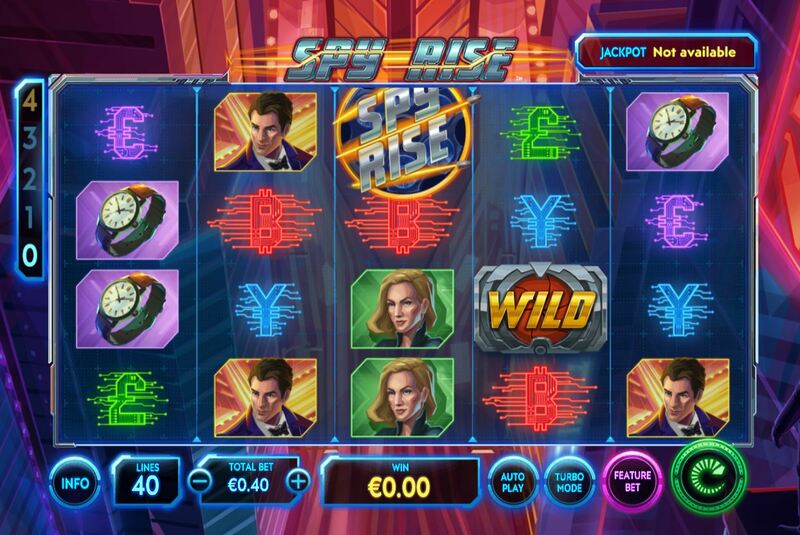 Spy Rise slot by Playtech is hardly James Bond stuff but more a modern-day cyber crime theme is seen here, with the reels set over a high tech cityscape illuminated by fibre-optics of the information superhighway. The music is dramatic mixed with artificially generated sounds as the reels land the overall appearance is a bit more advanced than other slots of the category such as WMS' Crime Pays and Netent's Reel Steal or Crime Scene. Can this spy make our bankroll rise though, or will the riches of these currencies here be kept safe forever? 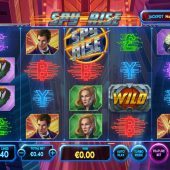 Spy Rise slot has 40 fixed paying lines over 5 reels of 4 rows each and symbols are single for the lower values and can be double-stacked for the picture icons including the Wild which appears on all reels. The game logo is the scatter and appears on reels 1,3 and 5. The 5-of-a-kind pays are 50x bet for the Male Spy, 35x Female Spy, 25x Car and 17.5x Watch. You get 5 digital currency symbols for Bitcoin, Dollar, Pound, Yen and Euro paying either 6 or 3x your 40-coin bet. We can change those pays though! You can pay 50% extra of your bet to upgrade one of the picture symbols and then it will pay 5x as much as the pays listed above, so the top-pay for example becomes 250x for the Male Spy. If you upgrade all of them the total stake is 120-coins and not 40 and they are upgraded in sequence so to get the Male Spy at 5x you'd need to choose all 4 upgrades. If you have the budget, I think this higher-volatility model is better. Land the logo scatter on 1,3 and 5 for 10 free games, no retriggers. Your enhancement is the fact the 40 lines pay both ways during them, in other words from right-to-left as well. That's it.